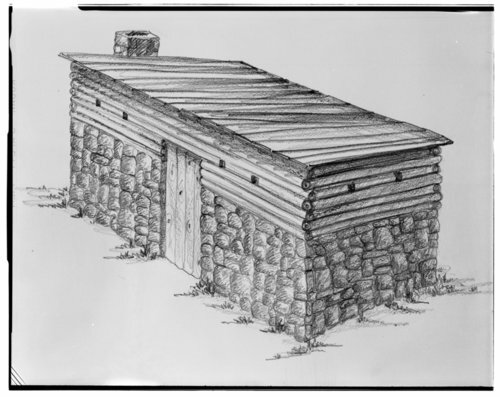 This is an artist's rendering of a fortified cabin built by John Brown at the site of the Marais des Cygnes Massacre. On May 19, 1858, proslavery supporters killed five and wounded five free-state supporters in a ravine near Trading Post, Kansas in Linn County. The massacre, which followed earlier guerrilla warfare activities on both sides, shocked the nation and became a pivotal event in the "Bleeding Kansas" era. In late June 1858, abolitionist John Brown constructed a fortified cabin, illustrated here, at the site of the massacre. The fort was reported to have been two stories high, walled up with logs and with a flat roof. Water from a spring ran through the house and into a pit at the southwest corner. Although the fort no longer stands, the site is listed as a National Historic Landmark administered by the Kansas Historical Society.